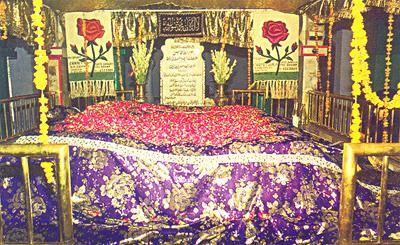 "Paradise lies under the feet of your mother"
Her Holiness was the daughter of Hazrat Khwaja Syed Arab Bukhari (R.A). She was highly respected and loveable mother of His Holiness, Mehboob-e-Elahi. She was educated, courageous, religious minded and absolutely punctual of Namaz, Roza, Ibadat (prayer’s) and strong belief in Almighty Allah Tala (God). She was a source of strength, peace and patience. Her Holiness life was full of miracles (divine graces). God listened to her immediately! In ‘Siyar-ul-Auliya’ His Holiness Sultan-ul-Mashaikh said that whatever his mother wished to do, (even before thinking about it, she dreamt of it) Allah Tala (God) fulfilled her wishes. His Holiness says that whenever she wanted any thing, she recited five hundred times Darood Sharif and her wish were fulfilled immediately. Once her maid servant ran away from her house, no one was there for doing her house hold work. She was totally upset! She put Musalla (prayers rugs) on the floor and started praying without covering her head and said "Oh, Allah Tala, I will not cover my head with Dupatta if you don’t send the maidservant at once!" She immediately heard a mysterious voice that some one is saying that we have arrested the maidservant and is at your door. His son (Mehboob-e-Elahi) hands over the maidservant to her. Once she dreamt and` heard a mysterious voice, asking her to select either the husband or the son. She selected her son Sultan-ul-Mashaikh. She did not disclose the dream but took extraordinary care and affection of her husband. on the next moon of the month"? His Holiness was taken aback and started weeping! He fell on to her feet and cried, "Makhdooma on to whom you are bestowing your son"? The mother said, "my son, come in the morning to listen and stay tonight at Hazrat Shaikh Najeebuddin Muta wakkil’s (R.A) house." "Allah Tala, you’re the creator of all creations, I am entrusting my innocent son to you. You are the Savior, the Sustainer!" and she took her last breath!